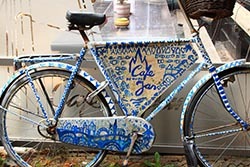 The city of Delft is a picturesque community in the Netherlands that was made famous by the Dutch painter Vermeer as also Delftware (hand-painted blue pottery). Today the town is equally popular for its various Universities imparting technical education. From Amsterdam Centraal I took a morning train to Delft. The return train fare was Euro 29.90. The journey time was 50 minutes. 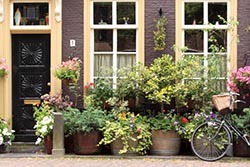 Like all Dutch towns, even Delft can be discovered on foot. The plan was to spend the entire morning out there and return to Amsterdam in the afternoon. 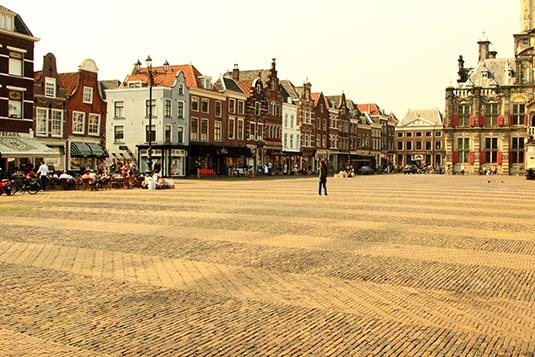 Delft Centrum (Old Town) is a 20-minute walk from Delft railway station. In the Old Town is all the action. The Oude Kerk (Old Church), nicknamed Oude Jan ("Old John"), is a Gothic Protestant church in the old city center. Its most recognizable feature is a 75-meter-high brick tower that leans about two meters from the vertical. The Oude Kerk was founded as St. Bartholomew's Church in the year 1246, on the site of previous churches dating back up to two centuries earlier. The layout followed that of a traditional basilica, with a nave flanked by two smaller aisles. During its build the foundations weren't strong enough to support the building, and the church began to lean. As they continued to build the church they tried to compensate its lean on each layer of the tower, but it remains to this day that only the 4 turrets at the top are truly vertical. The tower with its central spire and four corner turrets was added during the period 1325 to 1350, and dominated the townscape for nearly 150 years until it was surpassed in height by the Nieuwe Kerk (New Church). The slender tower of the Nieuwe Kerk shoots up almost 109 metres from its location on the Markt (market) in Delft opposite the city hall. For centuries, the royal tomb in the New Church has been the last resting place for the members of the Royal House. The New Church on the Markt dates back to 1381 and is closely connected to the House of Oranje-Nassau, the Dutch Royal Family. This church has the royal vault where the members of the royal family rest in peace. Prince William of Orange, the Father of the Nation was shot in 1584 and was the first to be buried here. His unusual and impressive mausoleum can be visited. It was built between 1614 and 1622 and was designed by architect Hendrick de Keyser. It was restored thoroughly in 1997. The choir isle of the church has various mausoleums, including that of Hugo Grotius. The Vermeer Center, which was opened in 2008, brings back Johannes Vermeer to Delft. The center is located at the historical location of the Saint Lucas guild on the Voldersgracht. Johannes Vermeer is one of the best known artists from the Dutch Golden Age. His name is inextricably linked with Delft, the city in which he was born in 1632 and where he lived and worked all his life. His paintings found their way all over the world. Seven of his works are still in Dutch museums: the Mauritshuis in The Hague and the Rijksmuseum in Amsterdam. Royal Delft, established in 1653, is the last remaining Delftware factory from the 17th century. The world famous Royal Delftware is still entirely hand-painted according to centuries-old tradition. 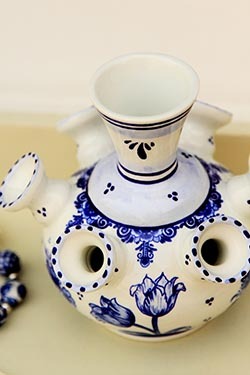 Visitors, for a fee, can participate in the Royal Delft Experience wherein they get to see the making of the famous pottery as also try their hands at it. The location is out of town. One can walk or take a boat on the canal. History has gelled well with the modern times. Delft is home to many Universities, most of them famous for technical educations. 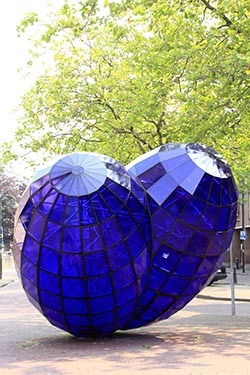 Delft University and The Hague University in Delft has produced thousands of engineers. Walking through numerous streets and crossing over many canals I reached the gates of Het Prinsenhof. Museum Het Prinsenhof tells the story of William of Orange and his role in the creation of the Dutch Republic. Highlights are the most important figures of the Netherlands Revolt known as the 'Eighty-Year War'. One can gain more information concerning the major events of this turbulent period. By way of a collection of 17th century art and handicrafts there�s an opportunity to discover the city that Delft was in the Golden Age. Actually, spending only a few hours in Delft is not enough. One needs to keep aside at least a couple of days to be able to explore this town, its many museums, churches, restaurants, galleries and Universities. Since spending more time was not an option with me, I walked back to the station to catch the train to Amsterdam.